My posts have been sparse for a while now and I’ve been asking myself lately – what’s going on? Why, when I’m as creatively engaged as I’ve ever been, do I feel a wall go up when it comes to sharing the process and excitement of projects in process? There’s been no “aha” moment of clarity to answer my question – but there has been a quiet unfolding of insights pointing me in a direction that goes back – back to an internal place of creating with more joy and less stress. Last fall, at the International Quilt Festival in Houston, I took a class on how to quilt your quilt top. Everyone in the class brought an unfinished top that was displayed for all present to offer suggestions and critique. 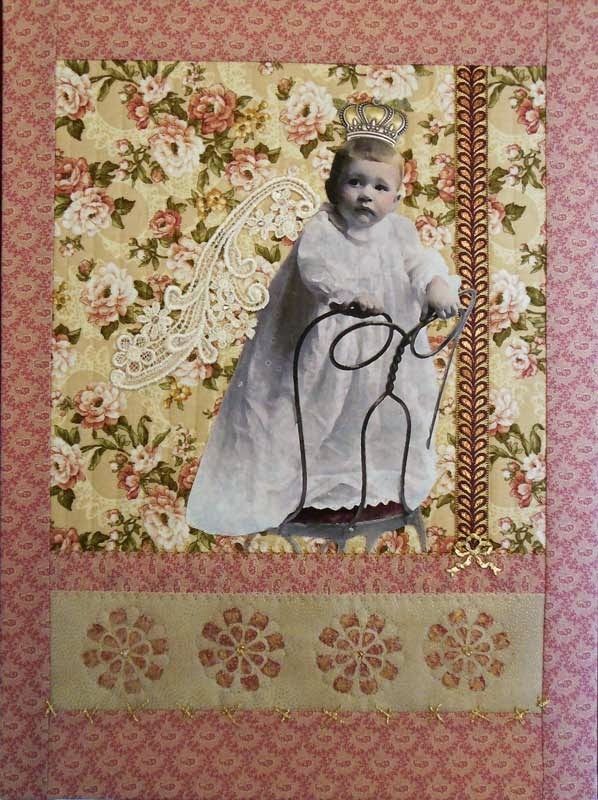 The teacher was Hollis Chatelain, a well known, award winning art quilter and I had assumed that the class would be comprised of quilters who shared her realistic pictorial aesthetic. It was quickly evident that nearly everyone but me had brought original but traditionally patterned and pieced tops. When my quilt went up mid-day I was very aware of how different it was from the others – in a proud but uncomfortable way. I had imagined that this quilt might someday be my first ever entry in a quilt show and I was hoping for some direction on how to proceed without ruining it. Hollis gave suggestions on directing the eye through stitch lines, but essentially handed it back to me as my own artistic vision to figure out. That was fine – but here was my real take-away from the class: She asked everyone not to talk about my quilt top to their friends, not to take my idea, and that this was an example of why she no longer allowed photographs to be taken in her classes. Flattering, right? Yes, it was…but also mildly paranoia inducing in someone (me) who is learning there are shows that won’t accept work that has been seen – anywhere. No blog photos, no social media exposure, nowhere, nohow. I started thinking about photos of my sewing studio that I had posted. Did I show too much of the pattern I had on the wall of my (in my dreams) future Quilt National quilt?! And should I have been putting watermarks on my quilt photos? And what about copyrights? 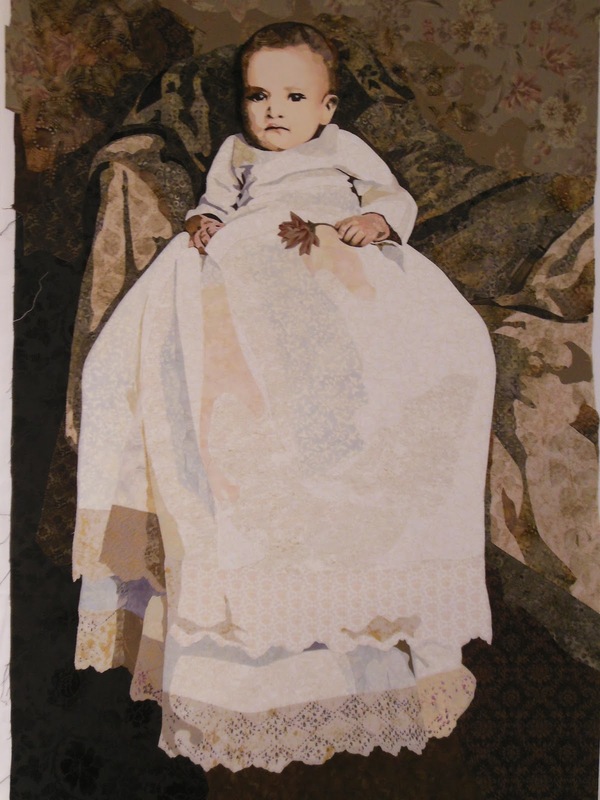 I belong to SAQA, a professional art quilt association. One of the opportunities the association offers for interaction with other members is an email discussion forum where self-promotion and congratulations are offered, problems presented for solutions, and various topics discussed. Trending topics lately have been copyrights and allowing photographs of your work. Invoking self-preservation versus marketing, the input has been by turns elitist and humble. The result, for me, is to be left wondering if I really want to care so much about it. I’m ambitious, yes, and I do enjoy my lofty dreams as much as anyone else, but maybe I enjoy showing off um, sharing 😉 and hopefully inspiring just as much. In fact, I know I do. So in that spirit I’m back to sharing photos of works in progress, even if they’re destined for show or sale. If my quilts are copied or rejected, well, my world will still go on. I create because I love the process, I’m a textile artist because I love the medium, and I share because it’s natural to want to show off what I’ve done that I’m proud of. In the end, I hope my quilts and words inspire others to both creativity and thoughtful positivity – because for me, that’s what it’s really all about. Linking here to Off The Wall Friday!